Khanhoo is a rummy game for two to four players. It was originally from China, though it experienced a period of popularity in England at the end of the nineteenth century. Khanhoo may be one of the earliest rummy games ever to be played. It seems likely that it at least influenced Conquian, considered to be the ancestor of most rummy games. The object of Khanhoo is to be the first player to form their entire hand into combinations called melds. A special 61-card deck is needed to play Khanhoo. To make one, take two decks of Denexa 100% Plastic Playing Cards and remove all of the 10s. Then, take out the face cards in hearts, spades, and diamonds, and all of the remaining number cards from the clubs. Shuffle these two decks together, and add one joker, and you’ll have your Khanhoo deck. It will contain the joker, two each of the J-Q-K♣, and two each of aces through 9s in the other three suits. You’ll also need something to keep score with. Game play begins with the player to the dealer’s left choosing one card to discard. This starts a discard pile, usually placed to one side of the stock. The turn then passes to the left. This player draws one card, either from the stock or the discard pile, and then discards one card. Turns continue in this manner, with a draw and a discard by each player in turn. If the stock runs out, its top card is set aside, the discards are flipped over, and then shuffled to form a new stock. The old top card then forms the new discard pile. As the entire deck is used in the four-player game, there is no stock. Instead, each player simply draws the card that was discarded by the player to their left. Sequence (1 point): Three or more cards of the same suit in consecutive order, e.g. 6-7-8♥. Note that sequences will never include face cards or clubs, as the only “sequence” that can be formed using them is actually the more valuable royal assembly (see below). Aces are considered low in sequences (just below the 2). Note that the point value does not increase if more cards are added. Aces (1 point): Three aces of any suit (duplicates are allowed). Triplet (2 points): Three number cards of the same rank and of three different suits (no duplicates allowed). Royal assembly (3 points): J-Q-K♣. Court melds (4 points each): K♣-9♥-9♥, Q♣-8♠-8♠, or J♣-7♦-7♦. Double aces (10 points): Six aces of any suit. Double triplet (10 points): Two triplet melds of the same rank. That is, six number cards of the same rank, with each suit appearing exactly twice. Double royal (10 points): J-J-Q-Q-K-K♣. Double khanhoo (15 points): A-A♥-2-2♠-3-3♦. As players form melds, they keep them in their hand (that is, they do not lay them out on the table). Thus, the players can rearrange and expand or split melds at will. The joker is wild, substituting for any other card in a meld without restriction. In a three- or four-player game, after a player discards, another player may intervene by claiming the discard before the next player can draw it. They may only do this, however, if they can immediately use the card in a meld other than a sequence. Taking the discard out of turn in this way is called bumping. When a player bumps, they must place the meld that the discard is part of face-up in front of them. They may then no longer alter the meld in any way (e.g. by making it from a khanhoo to a double khanhoo). They then discard as normal and play passes to the left, with the intervening players skipped. If the player who would have normally had the right to the bumped discard (i.e. the player to the left of the player who discarded it) also wants the card, they may challenge the bump. Both players must then declare the type of meld they wish to use the discard for. If the player that wishes to bump can form a higher meld, they get the right to the discard. If the other player can make a meld of equal or higher value to the bumping player, then no bump happens, and play proceeds as normal. When a player has formed their entire hand into melds, they make one final discard and announce that they are out. Each player then reveals their hand, placing it on the table with each meld broken out. Each player then scores the value of their melds, with the player that went out also getting a five-point bonus. The deal passes to the left, and a new hand is dealt. Game play begins until one or more players reaches a score of 50 points or more. Whichever player has the highest score at that point is the winner. Schafkopf is a trick-taking game for three players. Sometimes called the national game of Bavaria, it has been played throughout southern Germany for at least 200 years. Schafkopf is one of the ancestors of Skat, and the two share quite a lot in common. There are two theories for why the game is named Schafkopf, which translates to “sheep’s head”. One is that originally the score was kept by making tally marks on a sheet of paper in such a way that, when the game was finished, the marks made the outline of a sheep’s head. Another is that the name is really a corruption of Schaffkopf, meaning the top of a barrel. A barrel often made a convenient card table in the early days of the game. Because Schafkopf has been in play for such a long time, dozens of variations of it have been developed over time. Many of these rival Skat in complexity and capacity for skillful play. We’ve chosen one of the simpler variants to describe here. The object of Schafkopf for the declarer is to collect at least 61 points in tricks. For the defenders, the object is to stop the declarer from doing so. Schafkopf uses the 32-card deck common to German card games. 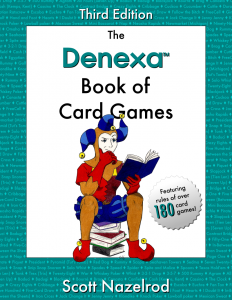 To make an equivalent deck from the international standard 52-card deck, start with a deck of Denexa 100% Plastic Playing Cards and remove all of the 2s through 6s. What will remain is a deck with aces through 7s in each of the four suits. You’ll also need something to keep score with, like the venerable pencil and paper. Schafkopf uses a highly unorthodox card ranking. First off, 10s are ranked above the king, just below the ace. Secondly, all queens and jacks are not considered to be part of their own suit, but are considered trumps! Queens and jacks rank in the following order: (high) clubs, spades, hearts, diamonds (low). Lastly, all of the diamonds are considered trumps, too, ranking in order just below the J♦. Taken altogether, that means that the rank of cards in spades, hearts, and clubs is (high) A, 10, K, 9, 8, 7 (low). The full rank of the trump suit is (high) Q♣, Q♠, Q♥, Q♦, J♣, J♠, J♥, J♦, A♦, 10♦, K♦, 9♦, 8♦, 7♦ (low). Got all that? The first order of business is determining who will take the widow. The player to the dealer’s left has the first opportunity to do so, or they may pass. If the first player passes, the next player to the left can choose to pick it up. If they, too, refuse, the dealer gets the last chance at picking up the widow. Should the dealer decline to take the widow, the hand is played “least“, as described in “Playing least” below. If a player does decide to take the widow, they become the declarer, and their two opponents become the defenders. The declarer adds the two cards from the widow to their hand, then discards two cards, face down. This restores their hand to ten cards. The player to the dealer’s left leads to the first trick. Each player in turn plays a card to the trick, until all three have played. Players follow suit if they are able; otherwise, they may play any card, including a trump. Whichever player played the highest trump, or the highest card of the suit led if no trump was played, wins the trick. They collect the cards from the trick, placing them in a won-tricks pile in front of them. They then lead to the next trick. It is important to remember that the queens and jacks are trumps and not part of the suit printed on the card. For example, if a spade is led, playing the Q♠ is not following suit, it is trumping! None of the other cards have any value. If the declarer successfully captured at least 61 points in tricks, they win the hand, and score two victory points. Should the declarer have collected 91 or more points, this is called a schneider, and they score four victory points. If they successfully captured all 120 points available, i.e. they captured every trick, it is called a schwarz, and they score six victory points. Likewise, if the declarer collects 60 points or less, they lose two victory points. If they are schneidered (capture 30 points or less), they lose four victory points, and if they are schwarzed (capture 0 points), they lose six victory points. If all three players pass on taking the widow, the hand is played least. All three players play alone, with a goal of taking the fewest points possible. Whichever player takes the fewest points scores two victory points. If they captured 0 points, they score four victory points. If two players tie, whichever one less recently took a trick wins and gets the two points. In a three-way tie, the dealer wins. In the event that one player takes all 120 points (meaning the other two tie at 0), that player loses four victory points and the other players do not score. Tyzicha is a Russian card game for three players. In this trick-taking game, the trump suit changes every time a player reveals a king and queen of the same suit. That means which suit is trump can change several times over the course of a hand! The object of Tyzicha is to be the first player to reach a score of 1,001 points. Points are scored by accurately bidding on the number of points that can be made on each hand and proceeding to collect those points. Tyzicha is played with a 24-card deck. 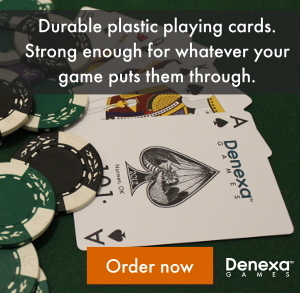 To obtain one, start with a deck of Denexa 100% Plastic Playing Cards. Remove all of the 8s through 2s, leaving 9s through aces in each of the four suits. It’s a good idea to hold on to a full rank of the discarded cards (such as all the 2s) to serve as trump markers. You’ll also need pencil and paper for scoring. Shuffle and deal seven cards to each player. Place the remaining three cards face down in the center of the table, forming the widow. The cards rank slightly out of their usual order in Tyzicha. The 10 is ranked just below the ace, but above the face cards. That means the full order of card ranking is (high) A, 10, K, Q, J, 9 (low). Before the hand actually starts, the bid for the ensuing hand must be determined. The player to the dealer’s right bids first. They may either make an opening bid of 110 or pass. The next player to the left (the dealer) has the chance to bid or pass next. Once someone has bid 110, the next player may raise by ten points to 120, or else pass. A player may not raise by anything other than ten points. When a player passes, they drop out of the bidding and cannot bid again on that hand. When two players have passed, the remaining player becomes the declarer, and their bid becomes the contract for the hand. Should the first two players pass on the first round of bidding, the third player (the player to the dealer’s left) is forced to play. A forced player may opt to accept a typical 110-point bid as usual. However, they also have the special option of making a contract of only 100 points. While this reduces their risk in the ensuing hand, it also limits their pre-hand options slightly, as described below. After the bidding is concluded, the declarer turns the widow face-up. Once their opponents have seen it, they take it into their hand. They then choose one card from their hand (either one of the cards they had before, or a card from the widow) to give, face up, to each of their opponents, bringing each player to eight cards. If, after exchanging cards, the declarer believes their hand has improved, they may choose to raise their bid. Raises must be a multiple of ten points. On the other hand, if they feel they are unlikely to make their contract, they may concede the hand. They deduct the value of the bid from their score, and each opponent scores 40 points. The hand is then over at that point. If the declarer was forced and bid only 100 points, there are slightly different rules for dealing with the widow. Neither the widow, nor the cards passed to the opponents, are turned face up. Also, the declarer’s bid is locked in at 100; they cannot raise beyond this. A player with a bid of 100 may still choose to concede, however. The declarer leads to the first trick. Each player must follow suit, if possible. If not, they must play a trump; only if they have neither a trump nor a card of the suit led may they play a card of the other two suits. Players must also head the trick. That is, they must play a card able to win the trick if they have one they can legally play. The highest trump played to a trick wins it. If no trump was played, the highest card of the suit led takes the trick. Won tricks are not added to the hand; instead, they are placed in a won-tricks pile in front of each player. The player that won the trick leads to the next one. Initially, there is no trump suit. If a player has a king and queen of the same suit when it is their turn to lead, they may reveal both of these cards as a marriage. They must then lead either of them to the trick. The trump suit then changes to that of the marriage. Which suit is trump may change multiple times per hand as players reveal further marriages. To remind the players of the current trump suit, keep an out-of-play card of the appropriate suit displayed, changing it as necessary. Once all eight tricks have been played, the hand is scored. The declarer totals the value of the cards they captured in tricks. Aces are worth eleven points, 10s are worth ten, kings four, queens three, and jacks two. 9s have no point value. To this total, the declarer adds the value of any marriages they revealed in the hand. A marriage in hearts is worth 100 points, in diamonds 80, in clubs 60, and in spades 40. If the combined total exceeds the contract value, the declarer has made their contract. A declarer that fulfills their contract scores the value of the contract (not their hand total). If the declarer breaks contract, they subtract the value of the contract from their score instead. In this case, the declarer’s opponents also score the value of their hand (calculated the same way as is done for the declarer). The deal passes to the left and new hands are dealt. Game play continues until a player reaches a score of 1,001 or more points. A player is capped at a score of exactly 1,000 points when not the declarer, meaning players must make a contract on their final hand in order to win the game.